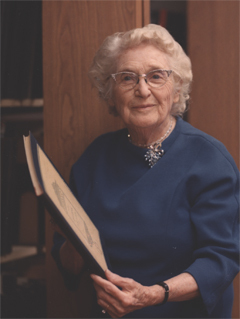 This brief account of the life and career of Lillian Helms Polley was gleaned from the archive of her materials that is housed in the Polley Music Library in Lincoln, Nebraska. The many programs, personal notes and memorabilia, manuscripts, letters, newspaper articles, reviews, and photographs in the archive collectively serve to draw a portrait of a woman who was central to the musical life of Lincoln during most of the twentieth century. Indeed, her gift to the city of a public music library keeps her spirit alive even into the current century. Many of the historical items were digitized so as to make them available online for public perusal. Some of those files are included in this page. Over 200 items appear in the Polley Music Library section of the Nebraska Library Commission’s “Nebraska Memories” page. This Polley Music project was supported in part by the Institute of Museum and Library Services and Technology Act as administered by the Nebraska Library Commission. Additional funding was provided by the Lincoln City Libraries. We are extremely grateful to both of these organizations for making this presentation possible. In these two quotes we have the essence of Lillian Helms Polley – the woman, the musician, the teacher, and the giver of an invaluable resource to the city of Lincoln. 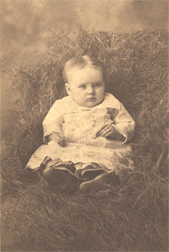 This charming, serious little girl was born Lillian Dobbs, May 18, 1881, in Creston, Iowa. She was the daughter of Edward O’Hail Dobbs and Cora Belle Henkle. On the first page of her personal scrapbook she preserved a genealogy which traces her familial roots back to Ireland. Her father, an investment banker, died of tick fever when Lillian was just an infant. 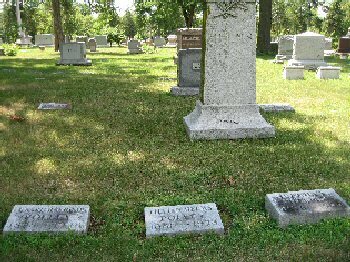 In order to help out her struggling mother, Lillian’s uncle, Elmer Henkle, (of Henkle and Joyce Hardware Company in Lincoln) brought the baby to her grandmother, Candace Cargill Henkle, who lived in Lincoln. Candace and the young child were “inseparable”, and Lillian believed any success which came to her should be credited to her grandmother. 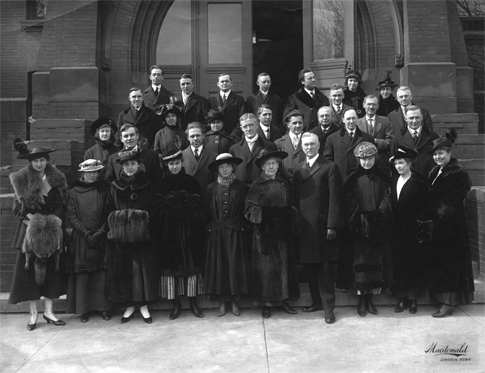 Lillian’s first public appearance, vaguely remembered, was at the opening of the Herpolsheimer building in Lincoln. It was a major social event celebrated with a ball and a grand march. She was a very small girl marching proudly at the end of the parade as the Tar Bucket. It had been “tenderly explained” to her by her uncle how important the tar bucket was to the covered wagon trains. She was four years old. 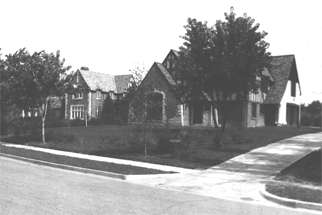 In the late 1880s the Henkle home at 11th and C Streets was convenient for school at Capitol Elementary and music lessons at the Nebraska Conservatory of Music at 13th and L Streets. She began her piano lessons at the age of six. She was very small, and could not reach the pedals on the piano, but she played for church socials anyway. After she grew a bit, so also did her repertoire, as seen in this program. She rode her bicycle to Havelock, carefully avoiding the street cars, to teach piano and organ lessons for 25 cents a lesson. She used the garnered quarters to pay for piano lessons with Professor Hadley at the Conservatory. She also accompanied for Clemens Movius’ voice students and used that money to pay for voice lessons with him. At the same time she studied Harmony with Lucy Haywood. From all accounts, she was a very fine young student, as can be seen in these 1890s reviews from the Nebraska State Journal. Lillian continued her music studies while she attended Lincoln High School. While she was there she was given permission to study French and German at the University of Nebraska; this served her well in her later vocal career. 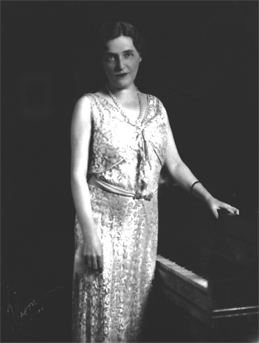 She graduated in piano from the Nebraska Conservatory of Music in 1896. She was fifteen years old. 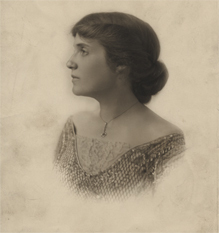 From 1897 to 1899 Lillian was an accompanist and voice coach in the Voice Department of the Conservatory. Some of Lincoln’s outstanding musicians of the time began to take notice of her. She was also leading a busy life as a recitalist and church soloist. Lillian had hoped to graduate from the University in 1905, but music made many interruptions in her academic schedule. She was invited by her aunt in Chicago for visits so she could hear fine music. She was in high demand as a performer at many local venues including the ProCathdral, St. Paul’s Methodist Church, Trinity Methodist Church, Wesleyan University, First Presbyterian Church, the Unitarian Church, the Jewish Synagogue, and the First Church of Christ Scientist. Like many musicians, she performed at various religious institutions without regard to their affiliations. It was the music that was important. Everywhere Lillian performed she was received with great enthusiasm. All of the reviews emphasize the beauty and clarity of her voice as well as her personal charm. She was quite a lovely young woman, with the red hair and blue eyes indicative of her Irish heritage; she stood just over five feet tall. In 1902 an additional interruption to her career occurred. She met young H. Finley Helms, a popular young dentist and teacher on the faculty of the University Dental College who also had a private practice located in the Burr Block on O Street. They became “enamored” and were married on December 17, 1902. Sadly, their life together was to be very short. 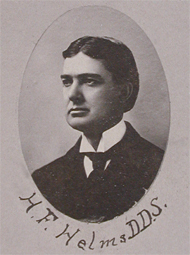 Helms died suddenly in their new home on July 31, 1905. In the typical fashion of newspapers of the day, the death was described in great detail. Apparently he had complained of a headache, and Lillian had used cold compresses on him to try to relieve the pain. A bit later she heard him fall in the bathroom. A doctor was summoned, but Helms died two hours later of a brain hemorrhage. 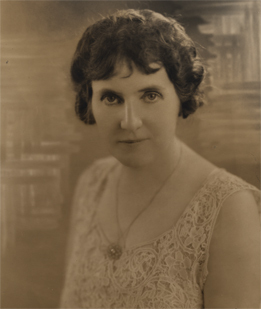 After her husband’s death, Lillian went back east to study with William Nelson Burritt in Carnegie Hall. When she returned to Lincoln, she continued her concertizing and teaching at the Nebraska Conservatory. Again, a review describes her considerable talent. In the mean time, Mr. Movius had gone to Wesleyan to join its music faculty. Under his recommendation she was offered a position there as a voice teacher, and she was on that faculty for two years from 1908 to 1910. During that time she also toured extensively throughout the area with other faculty members. Examples of programs from the period include performances at the Shelby Opera House in 1908, the Kerr Opera House in 1909, and the Seward Opera House in 1910. In 1910 Mr. Crancer, of Crancer Music Store in Lincoln, took Lillian to meet Willard Kimball who was the owner and director of the University School of Music. She was hired immediately and “began to teach in a little room at the top of the stairs.” Her teaching career at the University of Nebraska spanned the next twenty-eight years. When she joined the school, some of her fellow faculty members included Mortimer Wilson, Mrs. Will Owens Jones, Mr. and Mrs. Hagenow, Carrie Belle Raymond, Henry Eames, Howard Kirkpatrick, Charles Mills, Carl Steckelberg, and John Rosborough. These names read like a Who’s Who in Lincoln music history, and many of these individuals went on to national and international recognition. Lillian was in her element. Lillian’s teaching duties included both classes and private students. She taught Methods and Song Literature. She also continued a heavy performance schedule, appearing all over the mid-west as a soloist and for choral concerts at various colleges. She also began judging vocal contests. There is room here for only a very small selection of the programs from this period, but perhaps they will serve to indicate the breadth of her activities. They include programs entitled “Shakespeare and Music” 1911, “American Songs” 1912, and a performance at the Crete Opera House 1915. For recitals like these she frequently appeared in costume. Here she is in her American Colonial dress. While her teaching and performing kept her busy during the regular school year, she found time to study with teachers in Europe in the intervening summer months. She worked with Alberto Randegger and Celine de Polkowski in London in 1909, and with Madame Arthur Nikisch in Germany that same year. 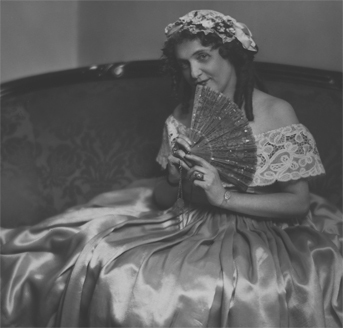 In 1911 she was the private student of Madame Emma Albani who was the leading soprano at the Convent Garden Opera. 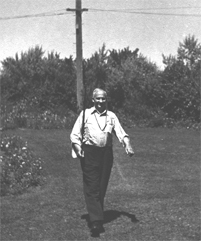 Richard von Zur Muehlen accepted her as a student in 1913 at his home in Steyning, England. Also, in 1911 she acted as the European music correspondent for the Western Musical Herald of Kansas City. In spite of all these activities, she seems to have had the time to be a normal young woman, at least once in a while. 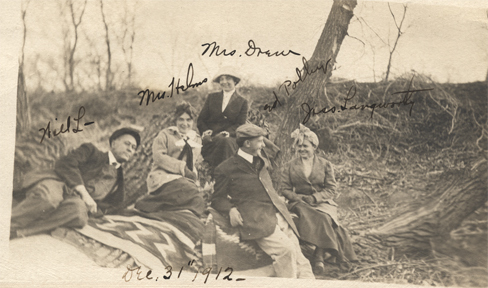 This picture from 1912 shows her at a New Year’s Eve social event with other young people her own age, including a young man named Ed Polley. On June 29, 1914 Lillian married Edward Harrison Polley. Ed was born in Seward, Nebraska and was a pharmacist in Lincoln. He was also known as a “Good Roads” leader and acted as secretary for the association of the same name whose goal was to improve Nebraska highways. 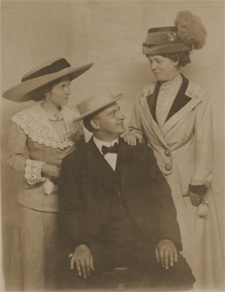 This is a picture taken in about 1917 of Lillian and Ed and Lillian’s mother, Cora Dobbs. This second marriage did not seem to interfere as much with Lillian’s career, and she continued her teaching and singing. She was always interested in the mechanics of singing, and in 1918 she even managed to wangle her way into an anatomy class at the University, much to the dismay of the Registrar and the amusement of her fellow faculty members as seen in these two documents. She was also free to study in Chicago in the summers between 1921 and 1932 with the nationally famous teachers Herbert Witherspoon and Oscar Saenger. These associations led to summer teaching positions at the Chicago Musical College for six years. Here are portraits taken of her during her Chicago years. Lillian was an astute businesswoman, and she knew how to promote herself. Here is an advertising flyer she circulated in the late 1920s. It was a good thing that she used materials like these. In 1930 the University “bought” the School of Music from Willard Kimball. Lillian stayed on to teach but there were a lot of departmental political hassles. She gathered up a number of letters of recommendation from her teachers, colleagues, and students and presented them to the Chancellor’s office. Finally in 1932 she was made an “official” Professor of Voice as recorded in this letter from Howard Kirkpatrick, then director of the new University of Nebraska School of Music. 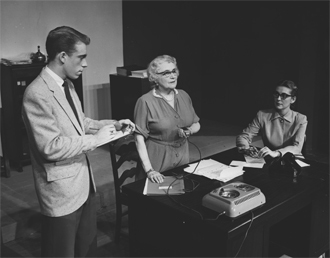 In spite of such experiences Lillian enjoyed her association with the radio community in Lincoln and frequently acted as an announcer and writer of program notes for radio shows given by local faculty members and visiting artists. In 1937 a “reorganization” of the music department was undertaken by the Board of Regents. Probably because of her age, her University position was again in jeopardy. She went into action and gathered up more letters of recommendation. In June of 1937 she received a letter from the Regents offering her an appointment for the 1937-1938 school year. The letter included this sentence: “You shall give no instruction in your subject off the University of Nebraska campus.” There are no written records of Lillian’s response to this dictum, but it should be noted that this was the last year she taught at the University. Being more or less run out of the University certainly didn’t tarnish Lillian’s national reputation. In 1939 she was named to the publication Leading Women of America. Her decision to retire from the faculty might also have been influenced by Ed’s declining health. She continued to teach at home so as to be near him. Here are pictures of an older Ed and their home on Woodsdale. Ed died in 1948 after a long illness. Lillian’s response was, “Mr. 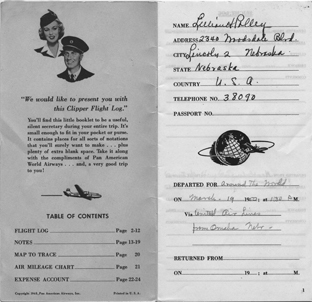 Polley’s death in March, 1948, made travel important for the next three years.” She had been to Europe many times, so in 1950 she set out on a trip around the world which lasted for about four months. 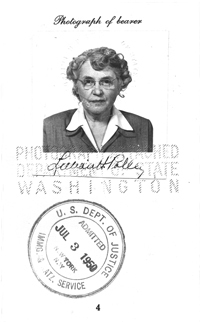 Her passport indicates visits to the Philippines, Hong Kong, Indochina, Japan, India, Egypt, Syria, Lebanon, Jordan, and Greece. She was a “natural” on stage because she could use her trained voice in the dramas. Over the years the Lincoln Community Theater awarded her three “Oscars” for Best Actress performances. Lillian kept up her teaching during this time, but carried a much lighter load of students than she had in the past. Her last fine student was Diane Knotek [Butherus] who, as Miss Nebraska in 1956, won the Miss America Talent Award for her lovely singing. Lillian’s high energy levels continued as she got older. She kept up her professional and civic affiliations with the Wooden Spoon, Nebraska State Music Teachers’ Association, Pi Kappa Lambda, Delta Omicron, the Lincoln Symphony Guild, Altrusa, P.E.O., and the Lotus Club. For the last group she wrote a history of the old University School of Music which was presented in 1967 and then published in the local newspaper in conjunction with Lincoln’s centennial celebration. Her archive includes the manuscript of that history. 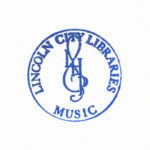 The late 1960s also marked the beginning of Lillian’s last great project in Lincoln, our beloved Polley Music Library. She said she got the idea for a public music library way back in the 1930s. She had been concerned by what happened to the music that was being donated to the University of Nebraska at that time and was especially distressed when the library of Carrie Belle Raymond simple “evaporated” from the shelves. She became determined that her large collection of scores and books would not suffer the same fate. In 1966 she gave the Lincoln City Libraries $12,000 to match a grant of Federal funds. The money was used to finance the building project which added the north and east wings to the two-story Bennett Martin Library and included a space that would become the Polley Music Library. She envisioned it as the beginning of a Performing Arts section in Bennett Martin Library. Her goal was to provide a place to house her collection and those of other contributors. It was to become a reference resource for students and teachers. The building project was completed in late 1968, and in January of 1969 Lillian received an invitation to attend a preview open house. Then, with typical energy, she proceeded to catalog her collection and to gather up many other scores and books from her musician friends in Lincoln. Polley Music Library was alive and well. Lillian died March 24, 1978. Her funeral book was brought to the library by her cousin, Giles Henkle. Her remains are at Wyuka, but her spirit and legacy live on in our Polley Music Library. Indeed, her benevolence has benefited a far larger area than she had envisioned; this library has enriched the lives of people throughout the nation and the world. What a wonderful gift this woman gave us all!